Lionsgate has optioned the rights to produce a film all about zombies ruining your tropical vacation. 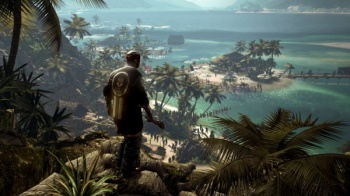 The release of Deep Silver's Dead Island was mired in trouble. Not only was the developer copy accidentally uploaded to Steam, but users then found some disturbing, misogynistic code hidden within than accidental copy. Those hiccups don't appear to have harmed the brand too badly, though; after being impressed by the cinematic style of February's haunting announcement trailer, Hollywood studio Lionsgate has optioned the rights to produce a film based on Dead Island's tropical zombie adventure. Producer Sean Daniels, whose portfolio includes titles such as The Mummy and Alfie, will head the project. In a statement, Lionsgate said that, "the film Dead Island will be an innovation of the zombie genre because of its focus on human emotion, family ties and non-linear storytelling." "Like the hundreds of journalists and millions of fans who were so passionate and vocal about the Dead Island trailer, we too were awestruck," added Joe Drake, Lionsgate's COO. "This is exactly the type of property we're looking to adapt at Lionsgate - it's sophisticated, edgy, and a true elevation of a genre that we know and love. It also has built in brand recognition around the world, and franchise potential." Given the remarks made by Lionsgate, it seems that the film will try to focus on themes similar the familial crises seen in the announcement trailer. How they can make this into an "innovation" in the genre remains to be seen; despite several "those children just escaped your maximum security compound on a moped while you watched them leave"-shaped plot holes, 28 Weeks Later dealt with the subject of familial crises during a zombie attack quite well. Would 28 Days Later have benefitted from more pina coladas? Lionsgate gave no indication of a likely release date, so we'll probably have to wait a while to find out.